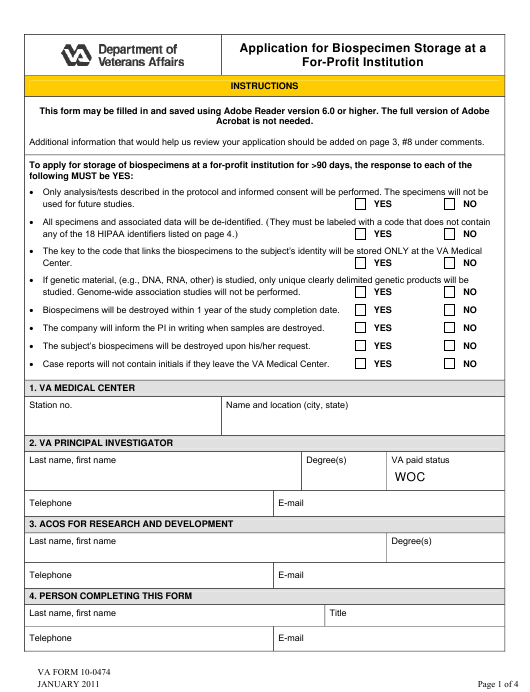 VA Form 10-0474 or the "Application For Biospecimen Storage At A For-profit Institution" is a form issued by the United States Department of Veterans Affairs. The form was last revised on January 1, 2011 - an up-to-date fillable PDF VA Form 10-0474 down below or find it on the Veterans Affairs Forms website. Additional information that would help us review your application should be added on page 3, #8 under comments.  All specimens and associated data will be de-identified. studied. Genome-wide association studies will not be performed.  Biospecimens will be destroyed within 1 year of the study completion date.  The company will inform the PI in writing when samples are destroyed.  The subject’s biospecimens will be destroyed upon his/her request.  Case reports will not contain initials if they leave the VA Medical Center. Please describe in detail the studies/analyses that will be performed on the biospecimens. Are other VA Medical Centers participating in this study? Is IRB and R&D Committee approval contingent upon this waiver? anything derived from the 18 HIPAA identifiers listed on page 4. If YES, state where and why it needs to be outside the VA.
this application has been approved. that the information can be used to identify an individual. identified in accordance with the HIPAA Privacy Rule as outlined in VHA Handbook 1605.1, Appendix B. For protected health information to be de-identified, all of the 18 HIPAA identifiers listed above must be removed. individual who is the subject of the information. identification criteria of BOTH HIPAA (i.e., removal of all 18 identifiers) AND the Common Rule.